Iphigenea, daughter of King Agamemnon, was sacrificed by her father in order to obtain favorable winds for the invasion of Troy. However, according to one version of the myth, the goddess Artemis (Diana) rescued the girl and substituted a stag to be sacrificed in her place. This painting is set in Tauris, where Iphigenea was deposited after her rescue. She has become a priestess of Artemis, who requires the sacrifice of all strangers who wander into the sacred precincts. 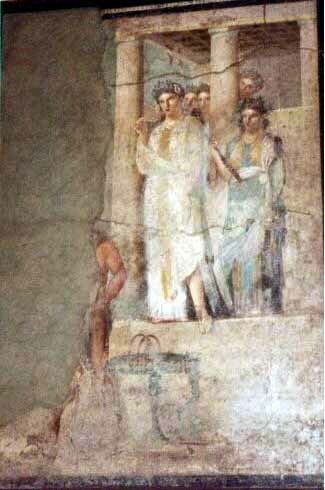 The painting depicts the dramatic moment when Iphigenea recognizes the latest victim (partly visible, lower left) as her own brother, Orestes. The story concludes with Orestes' rescue, flight, and acquital of blood-guilt in the murder of his mother, Clytemnestra. The story of this painting is told in Euripides' play, Iphigenea In Tauris.